Tourism organisation VisitScotland is encouraging people to celebrate Sunday's National Unicorn Day. The unicorn is the official national animal of Scotland and continues to feature on Royal Coat of Arms today. 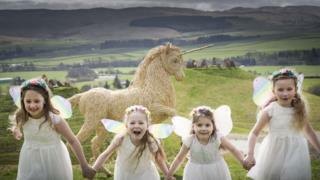 For Sunday, willow artist Woody Fox has created a 2.1m (7ft) unicorn sculpture for the Crawick Multiverse art project in Dumfries and Galloway. VisitScotland is also encouraging people to "spot" unicorns elsewhere in Scotland. Carvings and sculptures of unicorns can be found on historic buildings, such as the National War Museum at Edinburgh Castle. A tapestry called, Mystic Hunt of the Unicorn, hangs in Stirling Castle and a unicorn is a feature of a fountain in the courtyard at Linlithgow Palace. On the Black Isle in the Highlands, The Stables in Cromarty has a large unicorn sculpture. The unicorn has been a Scottish heraldic symbol since the 12th Century when it was used on an early form of the Scottish coat of arms by William I. Reasons for the appearance of a unicorn include a theory that narwhal, a whale with long tusks protruding from their heads, were seen in Scottish waters after straying from their usual range in the Arctic. Unicorns were also written about by the ancient Celts, Persians, Romans and Greeks, and were often described as an elegant white horse-like creature with a single horn capable of magical properties. Wales and England are among other nations that also celebrate fabled beasts. The Welsh flag features a red dragon connected to one of the country's legends, while England's patron saint St George is said to have killed a dragon. Artist Fox's other artwork has also involved animals, but of varieties that can be found running around the Scottish countryside. He said: "I was thrilled to be asked to create this unique sculpture of a unicorn to mark National Unicorn Day. "My previous work includes deer, badgers, foxes and rabbits which bring homes, gardens, parks and public spaces to life. "It has been very inspiring for me to work on this noble and spiritual animal for the first time and to help promote Scotland at the same time."